Sometime after I finish reading all of the nominees and after I do my last category write-up, I have a mind to write an article talking about what I think of this whole Hugo mess. I wrote several articles very early on, but since it has been an ongoing thing, I have different thoughts. But, those thoughts are not quite as germane to any individual category or any individual work and do not apply to taking the Hugo ballot seriously as it currently stands. So here we are. "Pale Realms of Shade" went in a very different direction than I had initially expected, what with the ghost of a murdered detective coming back to haunt and all. But, that is one of the more interesting aspects of reading stories because they were nominated for an award and not with the context of their original publication. Most stories don't necessarily require additional context, but "Pale Realms of Shade" was published in Wright's The Book of Feasts & Seasons, which is a story collection built around the religious calendar of the Catholic faith (if I have this correct). Knowing that context, readers who purchase the collection won't be surprised when the story takes a hard turn towards Heaven and Hell and a spiritual battle for a man's soul. But, where Wright's nominated short story "The Parliament of Beasts and Birds" (also from this same collection) felt extraordinarily heavy handed, with "Pale Realms of Shade" he did a beautiful job with the religious aspects of the story (which, ultimately, is the story and it is quite well told). The big surprise in this category, at least for me, was Tom Kratman's Big Boys Don't Cry. I had expected a very aggressive narrative designed to offend those of a more liberal persuasion, but what I got was a surprisingly graceful story of a dying sentient tank. That may sound weird, but given advancement in artificial intelligence and this being a science fiction story, it works. It works remarkably well, especially the deeper Kratman brings the story into Magnolia's history. Yes, there are also some clumsier jabs at how military tactics have been handled by those not committed to the mission or by those who don't fully understand what it takes to win, and politicians get the sharp end of the stick in that regard (rightly so, in some cases). If all of Arlan Andrews' "Flow" was as successful as the second half of the story, I might have been able to move it up another space on my ballot, but unfortunately the beginning of the story was something of a chore to push through. The primitive ice world (a partially frozen post apocalyptic Earth) was tough to take, less because of the writing and more because of what I was wanted / was getting from the story. I'll willingly take the hit that part of this is on me, but I often bounce off of fiction dealing with significantly more primitive Earth cultures unless the writing / storytelling can just grab a hold of me and make me care about the characters and / or the setting. "Flow" didn't...until it did, midway through as Rist began to discover more of the world and realized that what his people taught may not be the way things actually work. I'm now curious to find "Thaw", a previous story in this setting, and move on to "Fall", the next in the setting. I'd like to see where Andrews is taking this. In a typical year, I just jump right into whichever category I'm writing about and let my thoughts sort out the whole mess. This is not a typical year, so I'd like to start by talking a little bit about how I'm going to work through the various Hugo Award categories and how I am going to vote. Simply put, I am going to read everything. If I feel the work is strong enough to merit a ranked vote, I will vote for it in whatever order feels most appropriate. If I feel the work is not strong enough to merit ranking it above No Award, I will not do so. But at no point am I making a blanket statement about Sad Puppies or Rabid Puppies or that I've heard Thomas Heuvelt may have been campaigning for a nomination or anything else that I am not aware of. The ballot is what the ballot is and I will treat it as such. I am also working with the same methodology as I have in the past, which is to say that there are frequently works and writers on the ballot that I simply and strongly disagree with. In most cases, I have still ranked those works above No Award. I don't believe I have always done this, and I know if I had participated last year, one novel would have been below No Award because I bounced so hard off of the first book in that series that I really can't understand how the second also managed a nomination - and that writer is a Hugo favorite. Most stories compare to works that have previously been on the ballot, so those works that meet my low-bar criteria will secure my vote. The John C Wright novelette was found to be ineligible after the ballot was announced, and was replaced by the Heuvelt story. Unrelated to the actual work, this is one of the few categories on the Hugo ballot which I would like to eliminate. What the heck is a novelette, anyway? It is for works of fiction between 7500 words and 17,500 words and fits in between "Short Story" and "Novella". If I were revamping the awards, I would increase the upper limit of short story to nearly where the novella is now, lower the bottom limit of novella just a touch and live with two short fiction categories. But enough of my avoidance of the nominees, let's very briefly look at how I voted. Astute readers will note that while I have used No Award for previous categories and left nominees off of the ballot I did not wish to even consider for the Hugo Award, I have never used No Award and still ranked a nominee below it. Until now. "The Journeyman" was the least interesting, least compelling Novelette nominee and one which I do not feel is strong enough to win the award. However, I do think the craft and writing was good enough that leaving it off of the ballot felt unfair. As such, I am using No Award in the sense that if No Award does not win, The Journeyman might as well win. In the other instances, I am actively stating that I do not wish a nominee to win at all. It's all about how you use it. Comparing to previous years, "The Day the World Turned Upside Down" was the better Heuvelt story I've read (this is his third nomination), but I'm just not a fan of his fiction - though I will say that the concept of Earth flipping its gravity was a fascinating one, but he didn't do enough with it, the story was really about a man who simply cannot deal with the fact that he was dumped by his girlfriend and whines about it. I'm simplifying, of course, but while it was better than "The Ink Readers of Doi Saket" I wouldn't say that is a ringing endorsement. The best of the bunch here is Rajnar Vajra's "The Triple Sun: A Golden Age Tale", though I'm really not sure what the "Golden Age" part of it is all about. Is it a suggestion that the story harkens back to the golden age of science fiction or is it part of a larger Golden Age milieu that Vajra is working in. If the second, I can't find any other Golden Age tales. Regardless, "The Triple Sun" is a story with some space exploration, adventure, sass, and all in all good fun. I first discovered the Deryni series in 1993 following the publication of King Javan's Year. I would have been fourteen that summer and in my quest to find and read as much science fiction and fantasy, preferably fantasy, from my small town library I picked up King Javan's Year. It was brutal. It was wonderful. I didn't know what this was, but I wanted more. My librarian offered me three books from her person collection to read and eventually to buy: Camber of Culdi, Saint Camber, and Camber the Heretic. While King Javan's Year was my starting point, it was the Camber trilogy that hooked me and hooked me hard. I would read and re-read most of those novels multiple times until I graduated high school, but only seldom dipping into Kurtz's original Deryni novels beginning with Deryni Rising. It wasn't that I didn't like the Kelson trilogy, it was that there was such a separation in the chronology from the Camber era novels and the characters I really cared about were several hundred years in Kelson's past. Many of the details that I cared about, the mysteries and the magic and the rituals, were lost by Kelson's time. So I returned once again to Camber and ignored Kelson. But time passes and a handful of people in 2015 get into a conversation on twitter and one person mentions Katherine Kurtz, another yells out "Deryni!" and without quite realizing how, at least five people are doing a re-read of a forty five year old fantasy novel. I should note that it is a forty five year old fantasy novel that far more people should be talking about and recommending and putting on lists. One thing that struck me re-reading Deryni Rising is just how short of a time period the novel takes place in. While technically it is over two weeks, much of that is between the prologue and the opening chapter. Once Alaric Morgan arrives in Rhemuth, the time frame of Deryni Rising is a matter of days. So much happens in such a short period of time and a LOT of information is conveyed. I have to wonder what my impressions of Deryni Rising would have been if I had read this book first (as it was the first published), rather than after reading at least five earlier novels in the chronology. Would those hints of Camber and the Deryni persecutions rang as clearly if I didn't spend much of my teenage years nose deep in the events of that era? Probably not, but you can only read a book for the first time once. This time I have had a much longer break since the last time I had read those Camber era novels and I have only read the more recent Childe Morgan trilogy one time as it was published over the last decade (the Childe Morgan trilogy serves as a bit of prologue to Deryni Rising as it focuses on a young Alaric Morgan rather than the grown man we first meet in Deryni Rising). That break served to put my focus almost solely on Kelson and the story being told here and not so much on the Camber era. Since it has been so long since I've read Deryni Rising, I was impressed by just how good it was and how well it held up as a forty five year old novel. Because of changing tastes, writing styles, pacing, and having read thousands of books in the intervening years, it is not uncommon for an older book to not quite hold up as well as I might have hoped. Deryni Rising remains an excellent and important piece of fantasy fiction. Deryni Rising is the story of a prince having to take the throne far younger than he would like, barely into his legal majority, and having to fight the racial prejudice against his closest friend / adviser and battle a foreign challenger to his throne. On its surface, Deryni Rising is not all that remarkable. Plenty of novels deal with the topics Deryni Rising does. Except, they didn't. Not forty five years ago when Deryni Rising was first published. 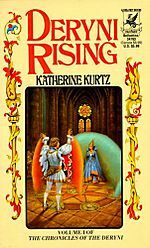 How Katherine Kurtz handled the historical political dramas in a fantasy world was groundbreaking and remarkable and set the stage for many novels to come. Katherine Kurtz deserves to be recognized for the master of fantasy fiction that she is, and her novels should continue to be read for many years to come. Via Tor.com, here are the winners of the 2014 Nebula Awards. Congratulations to all the winners. The beginning of a new month brings with it the opportunity to look back at the month gone bye and to give one last glance at what I most recently read. The below listed books are what I read during the month of May, I have reviewed nothing. Best Book of the Month: Can we have another novel from Sylvia Moreno-Garcia soon, please? Her debut, Signal to Noise was simply excellent and it's on my slowly building Hugo longlist right now. Disappointment of the Month: After all the praise of Sriduangkaew's prose, and specifically of Scale-Bright, I was surprised that with each page, I more and more did not want to read the book. Happily, it was short. I'm not sure why I bounced off of Scale-Bright, but it fell very much into the category of "I'm glad you liked it, but it's not for me", which is where I also put Sofia Samatar's A Strange in Olondria. I do still have Sriduangkaew's The Archer Who Shot Down Suns on my Nook, but I'm not inspired to push it up my reading queue anytime soon. Discovery of the Month: Signal to Noise. Go check it out. Worth Noting: Modesitt's Recluce novels are still solid reads, even after all of these years. I maintain that one should not read more than a couple of the books in short order because the writing and narrative style is so similar that some of the joy of reading can leak away, but if you space them out a touch - this is good, solid fantasy. Modesitt slowly fills in some of the gaps in the chronology of his long running series (Heritage of Cyador is volume 18). I've rather enjoyed Lerial's story and I feel there is enough room for one more book told from his perspective, though I don't know if that is Modesitt's plan or not. There are still a handful of stories / points in the timeline I would love to see him touch upon. Gender Breakdown: My library requests hit very weirdly and all at once where I expected some of them to be spaced out a bit better. This messed up my attempt at gender balancing the month. Like April, there were two books I did not finish, though I gave solid effort to each. May marks the first month this year I did not read more books written by women than those written by men. Only four out of the eleven were female authored. This brings me to 32 out of 55, which drops my percentage from 63.64% to 58.19% of my reading. Still a good year, still holding firm with just a small slide. I would say that I am still on track for hitting my goal of my first year where I've read more books written by women.